Prof Andrew Lever, University of Cambridge is a world leading expert on the HIV lifecycle and his research has characterised the detailed structure and mode of action of GAG-mediated viral RNA packaging into HIV capsid. Prof Lever has previously conducted a pilot screen demonstrating the feasibility to identify inhibitors of HIV packaging processes centred on the interaction between the GAG protein and the SL3 loop of the 5’ untranslated region of the HIV genome. This interaction is highly conserved and should therefore offer resistance to viral mutation. 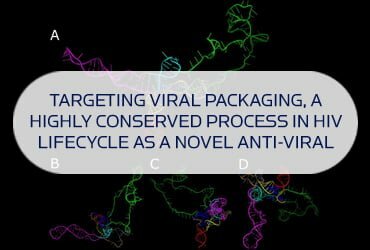 Additionally, the consequential empty but fully mature viral capsid may act as a therapeutic vaccine, offering further benefit to patient efficacy and resistance. Apollo and Prof Lever will initially collaborate on the development of screening assays to enable a future drug discovery project.